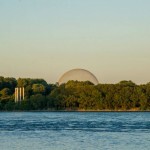 I have been visiting the City of Hamilton more and more lately and everytime it has a new surprise to share. The thing is, to Hamiltonians, it’s no surprise at all, just their day to day life. It’s like they are all holding this big secret from us all and laughing all the way to their fantastic restaurants, through their impressive festivals and during walks along the trails of their beautiful waterfront. Well, Hamilton, I can’t keep it in anymore! 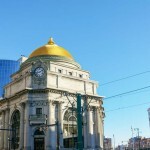 The secret is out – you are an awesome city. 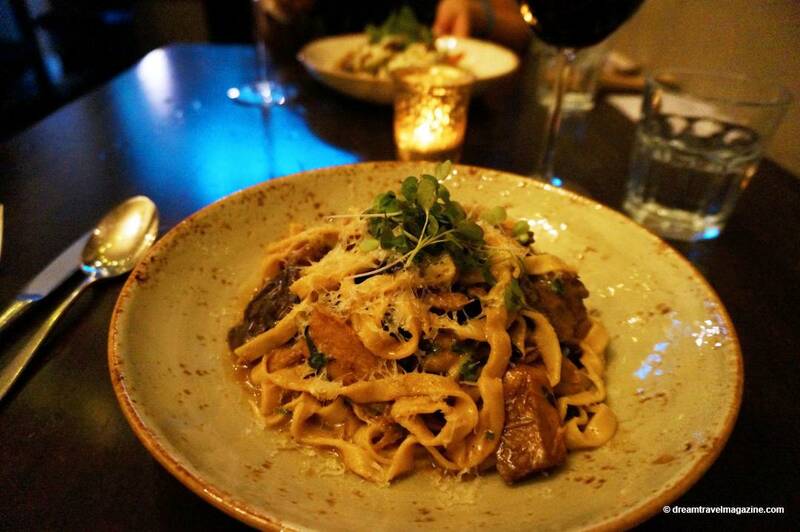 I first discovered a few of the incredible restaurants in Hamilton during a world wind food tour. 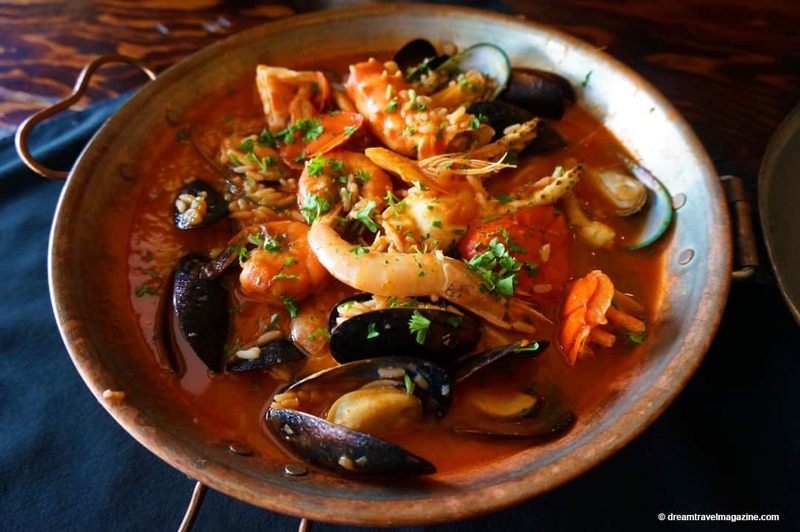 I covered our stops in this post ten foodie restaurant stops in Hamilton Ontario. Very quickly I learned this was just scratching the surface of something bigger. 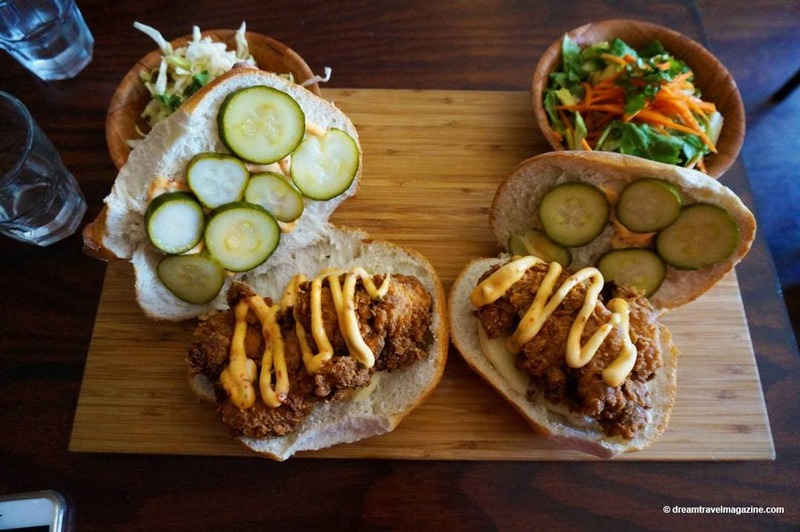 From food trucks, food kiosks to fine dining restaurants, Hamilton has it all. Here are just a few examples of more food discoveries. I’m addicted to Poké now. Ironically not from trying it in Hawaii where it all started, but from trying it at a booth at the Hamilton Farmer’s Market. 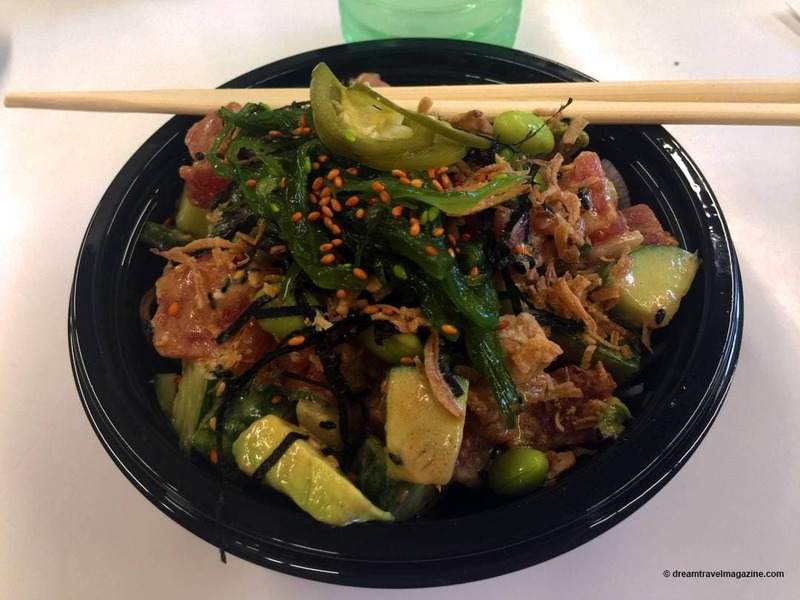 The Pokeh Bar in Hamilton is the first Poké bar opened in Canada and features a super healthy menu of these sushi bowls. Each time I go, I create an entirely different bowl choosing from over 20 different toppings. It’s a must stop when I visit the city, and I’ve also been known to make trips to Hamilton from Toronto just to eat their Poké. Until I find a suitable match here at home, this is my Poké spot. 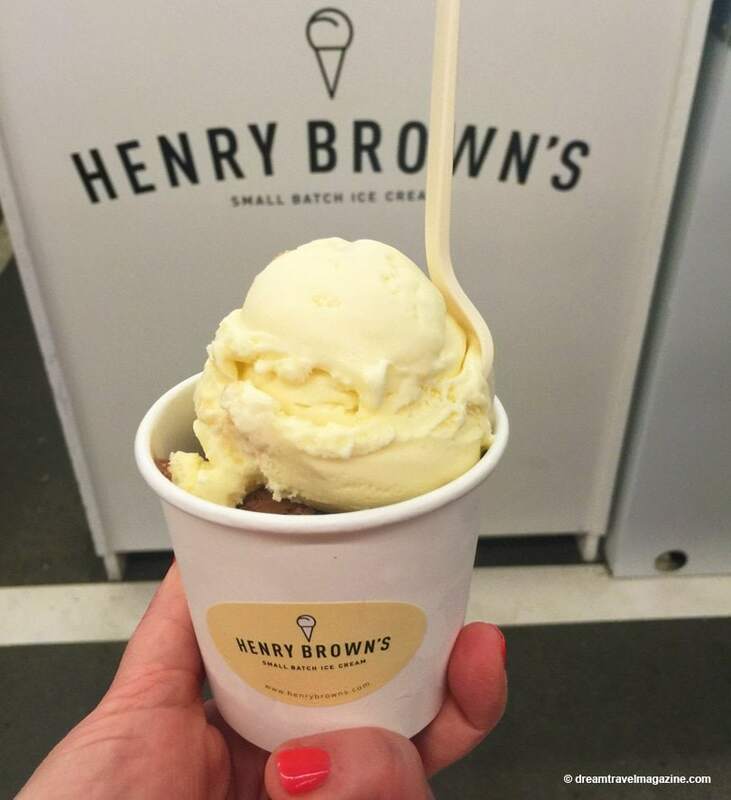 Right across from the Pokeh bar is small batch ice cream sensation Henry Brown’s. They produce small batch ice cream on-site every day. Made with natural, organic and local ingredients (when possible), these ice creams contain no gums, gelatin or artificial ingredients. The best part is the fun flavours they come up with. Roasted marshmallows, Chunky Churros and Peanut Butter Crackle, are just a few of my favourites. OMG! That’s the first word that comes into my mouth when I think about Salt Licks. I’ve never eaten a sandwich that caused so many flavour explosions in my mouth at one time. All you need to know is they have a passion for meat and prepare them in-house with their salts and rubs, and their passion shows through in every board that comes to your table. You can choose individual items too, but ordering a board lets you sample more. Too much yumminess for one post. Will have to share a review of everything that is Lake Road Restaurant in a future post. I’m not even spoiling it with a food post. 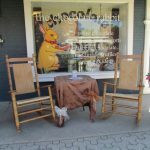 Trust me when I say, if you are going to Hamilton Ontario and need a place to go for dinner – this is the place! Ok. Fine here is one food shot of my main course at Lake Road Restaurant. I promise a full post is on the way. This is where my love for Hamilton accelerates. Even their food trucks promote healthy, locally produced ingredients. 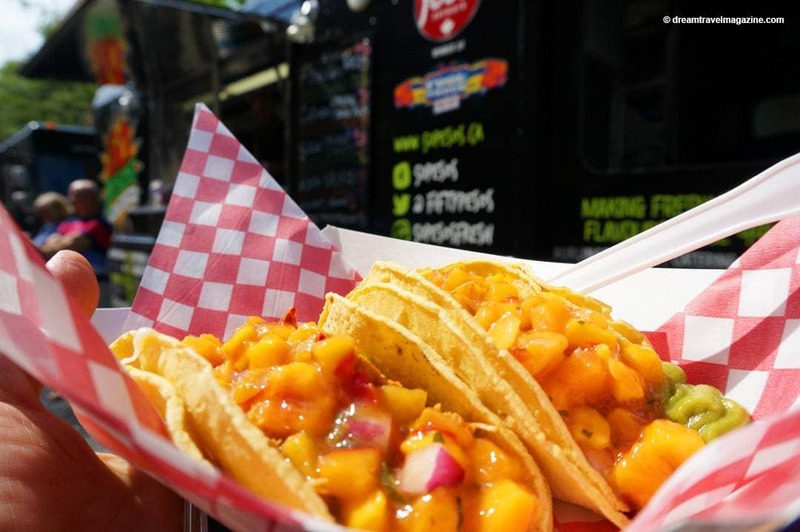 Jonny Blonde was voted best Food Truck in 2015 by Hamilton Spectator readers and with good reason. 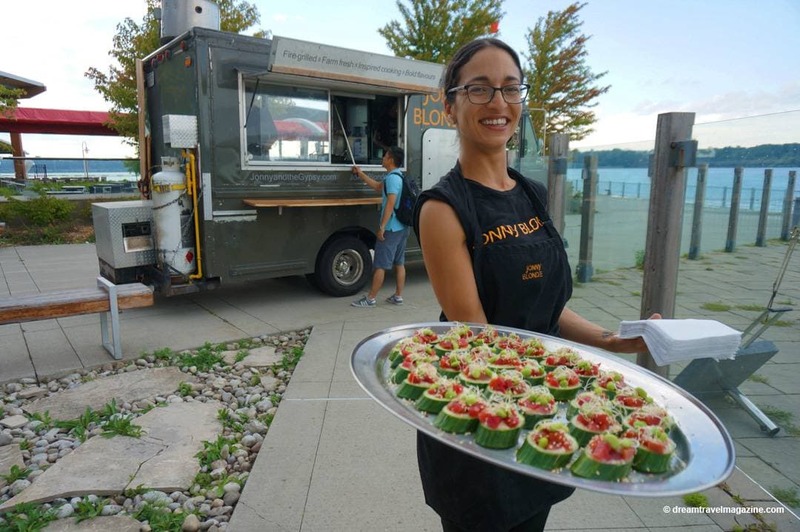 The food truck stops at many events in the Hamilton, Toronto and Niagara region and it features sandwiches made on Chef Jonny’s homemade, flatbread, along with salads, sides and desserts too. Across the highway in Burlington Ontario is the home of 50 Pesos. I got a sampling of this healthy Latin-inspired menu at Hamilton’s Supercrawl event. Served on doubled up soft corn tortillas their chicken tacos with mango salsa and guacamole was a delicious and filling lunch treat. 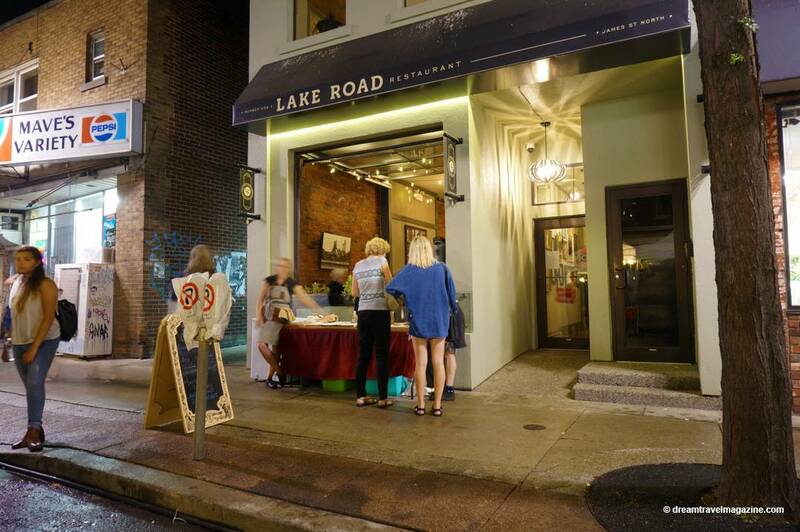 Every Friday evening, James Street transforms into an outdoor art gallery and exhibit. A fascinating thing about this weekly event is that no one owns it or organises it. The artists just show up, set up their little pop-up booths with their art or crafts and street fills with art and music. 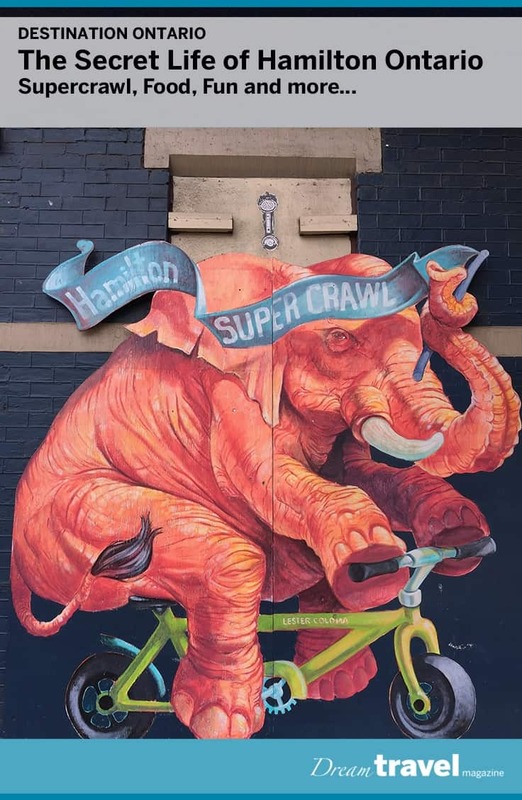 As an inspiration of Artcrawl Hamilton has put together, an official yearly Hamilton festival called Supercrawl. Featuring indie music, artists and local vendors the 3-day event showcased the best of the city. 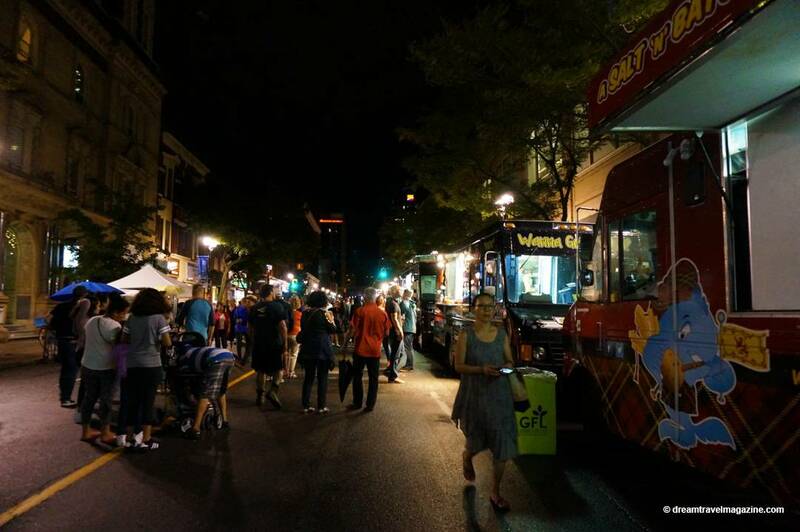 Food trucks were lined up in various locations on James Street and all the local restaurants featured special Supercrawl menus. 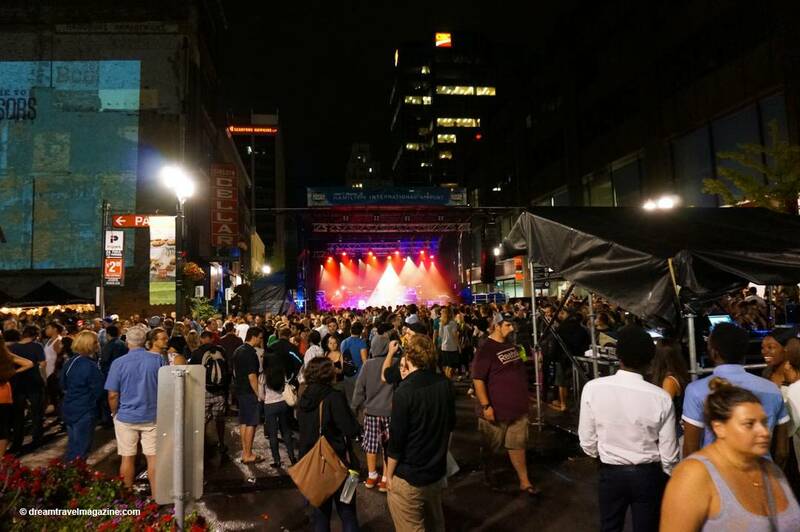 Several stages set up along James Street which featured a variety of indie bands. Throughout the day and into the late hour’s musicians rocked out to the large crowds. 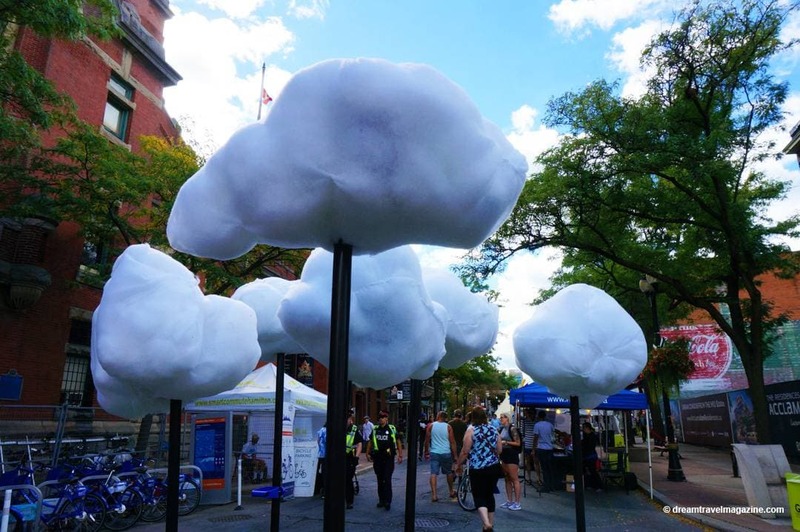 These cloud art installations could be seen as people walked with them up and down James Street. The central art installation was an exploding toy truck located in the middle of the entire event area. There were many activities and things to do for people of all ages. There was a family zone with arts and crafts and fun for kids. Local child entertainer Learning with Lexi whom I first bumped into at Artcrawl was happy to see us again. 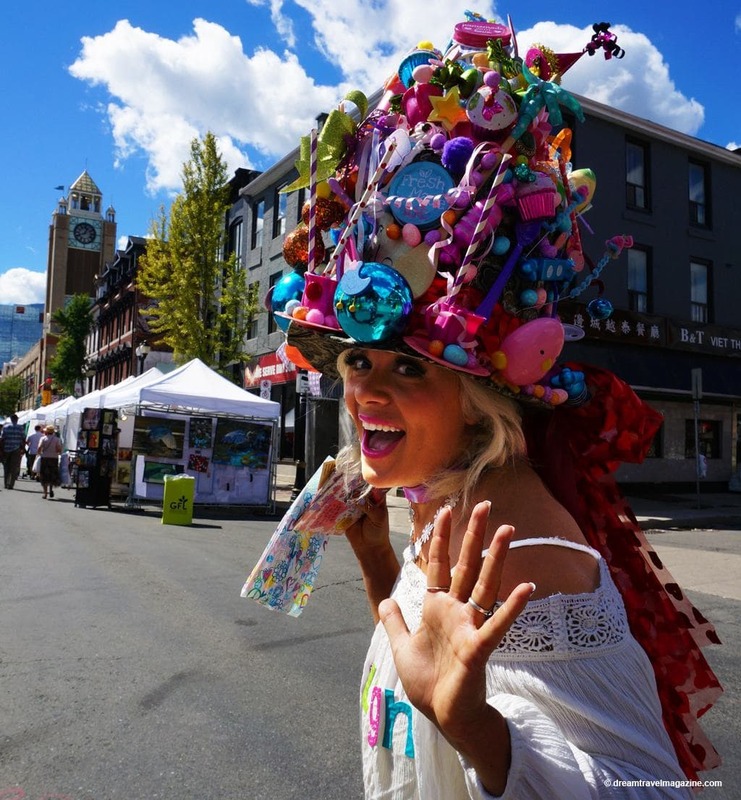 Her fabulous hats, energy and happiness just make me smile every time I see her. 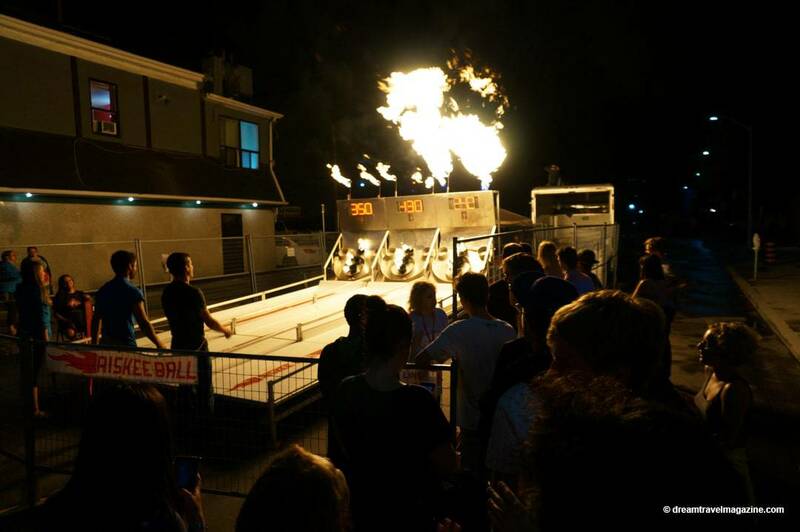 Oh and then there was the crazy, fire-breathing skeeball machine. This attraction had people lined up for a shot at hitting the targets. “Riskee Ball” as it was called was risky for both the spectators and the players as it shot out huge flames whenever the balls dropped in the goal holes. The higher the score, the greater the fire. 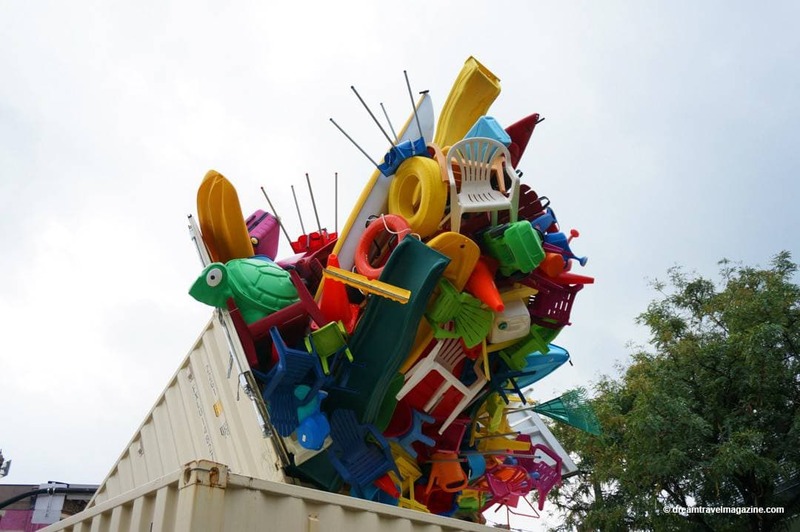 Amazingly all free and part of Supercrawl activities. On Saturday the weather was a bit unpredictable in Hamilton a muggy day with intermittent rain showers. Luckily for me, I missed a lot of the rain because I was at the Art Gallery of Hamilton studio, learning how to paint like William Perceble. 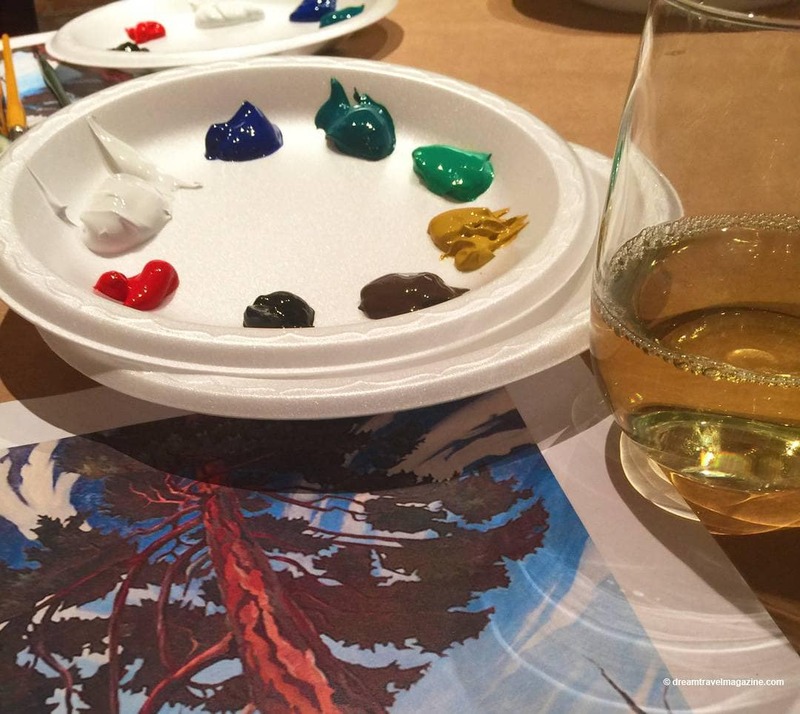 So much to say about these “Painting Uncorked” classes which are available not just during Supercrawl, but are held regularly at the AGH, another post coming soon. 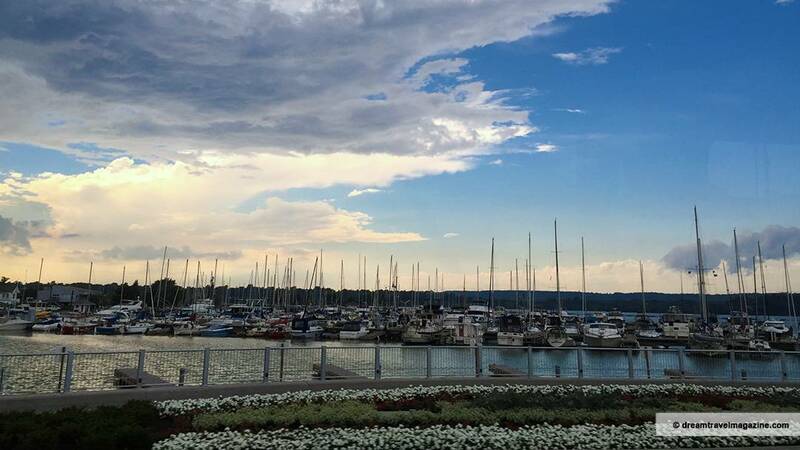 Looking back at my weekend in Hamilton, I am so lucky I stayed at the Sheraton Hamilton Hotel. It is located smack dab in the middle of Downtown Hamilton and was steps from all the fun at Supercrawl. The staff was so friendly and was genuinely interested in everything I saw at Supercrawl. The rooms are clean, renovated and of course, a full review of the hotel will be coming very soon. 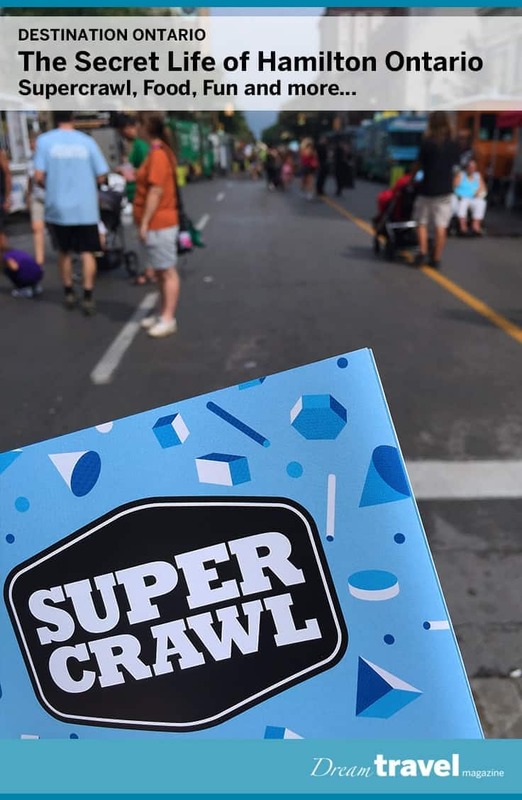 Travel assistance provided by Tourism Hamilton and Hamilton Supercrawl, however, the opinions expressed in this post are my own.